Simply Stewarts: The Golden Ticket! This is the last post on meeting the Pioneer Woman (PW). Promise! I do not think I have mentioned this so far, but The Sister came along with me to meet PW. And thankfully so. What? Are you kidding me?? I knew this Pioneer Woman was a popular gal, but I guess I did not realize how many people would come out for a book signing. “And oh, they said last year she was here until after 2am signing books.” The Sister said. I called the husband to inform him that not only would I not be home by 8:30 pm as previously anticipated, but I would not be home anywhere in the vicinity of 8:30pm. See you soon dear….or, maybe tomorrow. He laughed and said have fun. We decided at that time to go ahead and get our seat up front for the question and answer period. This worked out well as we were right up front and had a great view of PW. Not long after we sat down with our blue arm bands, this girl and her husband sat down beside us. They asked us what color we were and we told them blue. They too had the blue bands and asked a few questions. Since The Sister was all knowing (or at least more in the know than anyone else around) she explained things to them. From time to time we would chat with these two and we learned they had driven from Houston! That is what I call commitment. The Sister and I later dubbed these two as “The Houstons” prior to knowing their names. After PW spoke it was time for the first group to get in line for the signing. The Sister and I sat there for a minute watching. I could not believe that PW was taking time to chat with EVERY single person and signed ALL their books. Some people would have five or six books for her to sign! The Houstons decided to get up and walk around, but we said that we should meet up once we got in line. Sounded great to us! The Sister and I got up a little while later and walked over to see PW’s husband and children and then wander around the store. A little while later, we look up and The Houstons are standing in line! Um, what are you two doing in line?? That is when she held up her arm and we saw that she now possessed a GOLDEN wrist band. WHAT. THE. HECK? Where in tarnation did that come from?? Mrs. Houston explained that she had obtained it from a girl who was up a little further in line AND she had a feeling the girl had another. I could not get up to that girl fast enough! Hey, I heard you have golden bands! Got another? Seriously, what had become of me? I was now going after strangers trying to obtain ARMBANDS!! But, before I had time to loath myself too much and fixate on how crazy I must look, this girl whipped out a gold band from her pocket and gave it to me! Yes, I actually said this. And in my head the music from Willy Wonka was playing. I love having a soundtrack to my life. Gold was already in line and The Houstons let us get in line with them! However, make no mistake, it was going to still be a long wait. However, we thought that we would be saving ourselves at LEAST an hour or two of waiting. While standing in line we learned the Houstons real names and a little bit about them. Most fascinating was that Mr. Houston tried out for American Idol this year. He tried to gloss over this as if it was no big deal. Hold on there. Wait just one minute! We will need the full story on this little tidbit of your life! Interesting is all I have to say. Well that and, if I had much respect for that show before, now I have none. Zilch. I really have no idea how long we stood in line. I think it was for about four hours or so. The line wandered throughout the entire store. We would look up and find ourselves in the travel book section, then music, death, the SATs and LSATs, learning foreign languages, and the discount books. With each new section some crazy conversation would emerge. It was in the foreign languages section that I started to get a bit nervous. All I could remember was Joshua telling me not to say something stupid. I determined that I would just tell her how much I loved her recipes and that it was the mushrooms that brought me to her. And that is what I did. 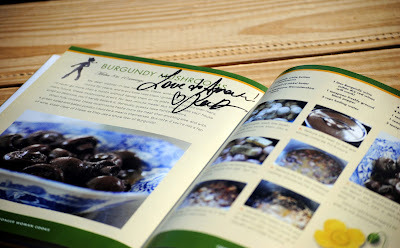 I had her sign the mushroom page of my cookbook and we talked mushrooms! Nothing exciting really. Except for the fact that the woman has a way of making you feel like she is really your BFF. And that you have been cooking with her for years and taking care of each other’s children. After we had our books signed, we talked a bit more to the Houstons and bid them farewell. When we walked outside and looked at the clock it was past 11. HOLY WOW! I feel certain that had we not obtained the gold band, we would have been there at least two more hours. Never in my life have I stood in a line like that for anything! And I do not think I will be again….unless she comes back. With another cookbook! It was totally worth it. Totally. Oh -- really, the reason she was there was that she was promoting a novel she wrote. I took a break from standing in line at some point and went and bought it. And I am glad I did. PW signed it too. The book is a great and an easy read. It is the true life story of how she met and married her husband. And here it is…..PW’s signature across the wonderful mushrooms!